Yoga for Weight Loss – Hips & Core is a special 12 min swift flow focusing on core strength and stability in the hips. This intermediate Vinyasa is set to the rhythm of the breath inviting you to find balance, get your blood pumping, and your energy flowing so you can feel good. When you feel good, you look good. Listen to your body, breathe deepm and invite in an ocean of love. Start inside. Let’s go! This sequence was shot with love at Playa Maderas in Nicaragua. I just wanted to express my appreciation for your free video series. I have been viewing several of them repeatedly for a couple of months since my daughter made me aware of them. My back and neck feel so much better when I follow your practices! They are just the right length and intensity for me. I have recommended your videos to several other fellows, too. I wish you great commercial success! One thing I haven’t figured out is what you mean by a ” checklist.” Is there a literal checklist I should know? I couldn’t find one on the website. I was a little thrown by the vocab as well. I went to the YouTube channel and checked out the beginners videos but what was REALLY amazing- 31 day revolution!!! I was also told about it from someone else and LOVE all the videos!!! Tom, I have been trying to get my husband to try yoga so your testimony is helpful! Also, what I think Adriene means by “checklist” is just doing a mental body-check. Focus on each part of you and notice how it feels. I picture like a top-to-bottom scan – head, shoulders, knees, and toes! A good way to go through your “checklist” is to start from your toes and feet and then move upward bit by bit. One example: direction of toes, weight on heels or not, knee adjustment, hips, lower back, middle back and belly, chest, shoulders, arms, palms and fingers, neck, face muscles, gaze and finally top of head. This bottom-up direction puts yogis at lower risk of injuries and it can also make it a bit easier to actually stick with the first set of adjustments that you’ve made. As the feet are the body’s ground pillars they usually stay put through the rest of the cheklist, compared to shoulders that have this strange behaviour where they just fly back up towards the ears as soon as you focus on something else… hope this helps! This looks like such a gorgeous place, paradise… Thank you for all your yoga poses, video’s. I need to work on my core. Thank you. Summer is very busy with children visiting and little running feet of grandchildren but ONE thing remains the same, my YOGA WITH ADRIENE. Can’t wait to do this video with you tomorrow morning. When are you going to come to Canada? We would love to see you in Toronto. The courage and love in your heart just flows naturally, but you were extremely courageous to film this with that thunderstorm approaching! I could just feel the ocean breeze just ripping through my clothes and felt the coolness on my body as I shared this practice with you. Something you will always remember! And I as well!!! Many blessings to you, and thank you for coming into my life! I’m in sync with Emerise !! Fortunately there is Yoga with Adriene !! I have weak wrists and cannot do downward dog, chaturaunga etc. I saw your hands free yoga video and wanted to start doing that regularly, but I don’t want my legs to get bulky. Will that happen with the hands free yoga? I want the August calendar but get a black screen with “blocked plugging” on it and can do nothing. PS I have my ticket to the Roadshow when it comes to Santa Fe!!!! YAY!!! Hi! I have the same problem, I just downloaded Google chrome and view it on it 🙂 its a bit more tricky, but works well! Good luck with your yoga practice! Today marks my final day in Austin. I am so grateful that I had this time to visit, explore this unique community, and experience your yoga class in person yesterday at Practice Yoga Austin. I found myself feeling rather emotional yesterday after class and with having the opportunity to say a quick “hi” and snag a picture with you for my trip album. Perhaps I felt overwhelmed by sensing the genuine joyfulness, love and kindness that you exude through your videos, and even more so in real life. Thank you for encouraging myself and others to be kind to ourselves–body, mind and spirit–so that we can become more of who we really are. I hope to get to take more classes with you in the future, but for now, back to rolling out the mat in my living room. Thanks again for all that you do. Take care, Adriene! You are such an inspiration! I am a long time follower of yours (3+ years) and a loving Kula member. Your yoga videos have gotten me through so much over the years, physically and emotionally. I have several auto immune diseases, so maintaining good heath is tricky. I know there are a lot of people out there in the same boat, just trying to have a normal day. Would you ever consider doing a yoga video that targets thyroid health? I have Hashimoto’s thyroiditis, and right now I am trying to naturally heal my thyroid without having to take any medication. I thought maybe yoga would be a great way to do this, and your yoga videos are always so perfect. Finish med 31 day revolution and now checking out some of the other videos and I need some advice. Now that I enjoy yoga everyday I have began to have horizontal cuts on my big toes. It’s as if the grip on my yoga mat is rubbing my toes raw. Any advice? Am I not balancing correctly? Any suggestions on how to help or is this not normal for yoga practice? Hi Adriene, I wanted to thank you for helping our family to say goodbye to our beloved pup, Jovie. Jovie passed away last week after a courageous battle with thyroid cancer. Jovie was a beautiful. mutt. She was loyal, affectionate and very silly. We were beyond fortunate to have her in our family for nearly 8 years. The weekend before she passed it became apparent that our time with her was coming to an end and ultimately we knew that Monday would be our last day with her. While we would have loved to spend that time doing the things she loved; tossing her popcorn, or going for long walks on campus, unfortunately, over the weekend she became to weak for that. So as I tried to think of ways to be with her and comfort her, I was reminded of what my daughter had said to me a few months ago. My daughter Noelle and I practice yoga with you. And Jovie was always by our side. She’d slide under Noelle’s bed and and lay there for the duration of her practice. I often began my practice with Jovie sitting at the front of my mat, staring at me until my cat cow or downward dog pushed her out of the way. Then she would take her place alongside my mat. What Noelle brought to my attention was that while Jovie wasn’t necessarily interested in being in Noelle’s room when she was reading or doing schoolwork, when she was practicing yoga, Jovie would scratch on the door to come in. She would do the same when I was practicing in my room. Noelle determined that it was your voice, Adriene, that Jovie was drawn to. And so on that last morning, Jovie and I practiced together. And when I was done I let the videos continue and I am certain that your voice soothed and comforted her. Our family is without a pet for the first time in 18 years and we miss Jovie terribly, but we have countless wonderful memories. Thank you for being a part of that. Hi, I’m going to be without Internet access for the next few months and would love to download my fave yoga videos before it’s too late so I can still carry on with the ywa. Is there a way I can do this? Love your work! Hi! 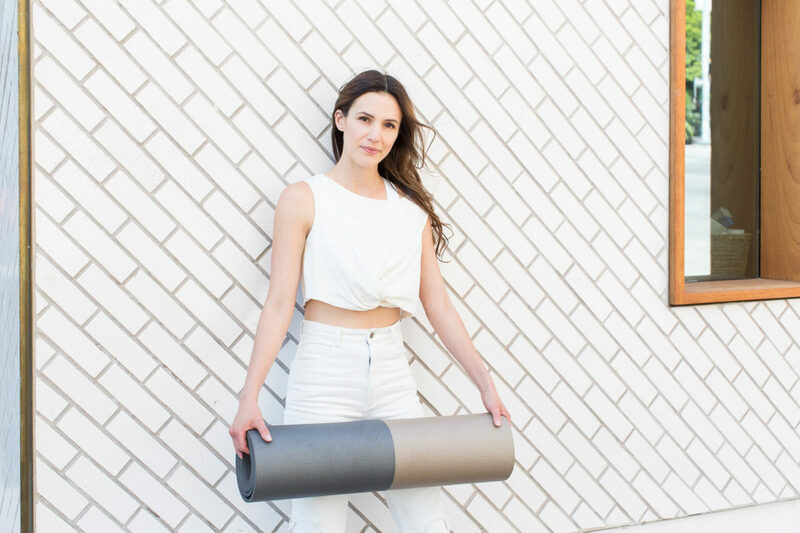 I can tell you, if you become a member of Yoga with Adriene on her site: https://yogawithadriene.vhx.tv you can sync them for offline viewing! Its definitely worth a try, plus you can have a week for free! Adrienne- I am in the 6th month of Yoga teacher training in Washington DC. I have been watching your videos in gratitude for all that I am learning about how to teach yoga in such a calm, fun , and easy to understand manner. You are so inspiring. If I can teach like you some day I will be well on my way to sharing this gift of yoga. I work as an RN in an inner city public health clinic and hope to bring yoga for my patients with chronic pain. In much gratitude for all that you offer to so many of us; your gift goes on and outward! This quickie helped me feel oh so good! Thanks Adriene! How much weight should I realistically expect to lose doing one of these videos a day? I weight about 135 pounds. I have been following you for a few years and I find such a difference to my body , thank you so much for all these happy yoga mornings !!!! This is one of my absolute favorites! It’s the perfect way to ease into my day…with beauty, stillness and grace. I love the heat this practice brings too! Thank you for this sweet sweet gift! Having a hard time keeping up with you but I LOVE this video and getting a little easier each time. Thank you for sharing your talents, love, and passions with all of us! I found you just after the new year started and I have been present everyday since. Love the changes happening in my body, mind and very soul! This has been a delightful, inspiring, much needed, and awesome experience! YWA has become a major part of my morning routine. Absolutely fabulous!! Thank you for allowing all of us to join in and get healthy and happy for no cost. What a blessing!! I loved this practice today. Such a sweet flowing yoga session. Feels good!!!! God bless you, Adriene!! You are an answer to prayer!!! grateful, strong, happy and at ease. Thank you so much, Adriene. I can’t even tell you how much your yoga and your affirmations have meant to me. I have convinced three of the women in my family to join me in following your “dedicate” series this year. Can’t wait! I have been doing this video every day for a week now and I feel good (I found what feels good, thanks to you Adriene!). It looks so easy looking at it… But not so easy at all (but getting better everyday). Thank you for this website and videos, so grateful!